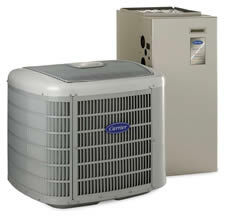 As anyone is aware, one of the cadillac heat pump systems on the market is the Carrier Infinity Heat Pump price not being a factor, many hvac contractors will tell you that when it comes to a system they would choose for their own home, these 2-speed carrier heat pump systems are by far, one of the most advanced you can get! The Carrier Infinity heat pump price, well that’s another story! The cost of Infinity heat pumps has been known to be a little high… lets see. This HVAC systems price was submitted in August 2010 from Lou in Asheville NC. Thanks for the chance to share what we paid for our Carrier Infinity Heat Pump system. We live in a mountainous area of NC where we have no natural gas service, therefore our home is 100% electric. We had considered going with a dual fuel hybrid system and using propane for the heater, but after speaking to a few friends, we decided it was not worth the effort. Our home is just over 1400 sf, and has an entire wall of glass facing the west. This means we get a good bit of heat in the late afternoon and needed an efficiency system to both cool and dehumidify our home. The Carrier Infinity heat pump just made sense due to the 2-speed compressor and the variable speed blower unit. Even though it was a bit more expensive than we wanted to spend, it only took 1 visit to our neighbors home to help us decide! Infinity 4-Zone Heating and Cooling damper system with remote sensors. All Labor and related materials. I will say that we weren’t completely impressed by the installers of the system, they smoked and left cigarette butts in our yard. Aside from that however, the full install took a total of 2 days, and we are completely thrilled with the final outcome! The zoning system is far better than we could have imagined and my wife loves how her studio is now at the exact temp she wants during the day! It’s much too early for us to leave a detailed review of the Infinity heat pump system yet, but we will return this coming winter and leave a full opinion. I would love to hear from other owners to see how they like their systems, and to heat about their Carrier Infinity heat pump price as well. We had one of the infinity heat pump systems installed in the spring. This year was the first summer in a long time that I was actually comfortable in my own home! 5-Star heat pump for sure! !